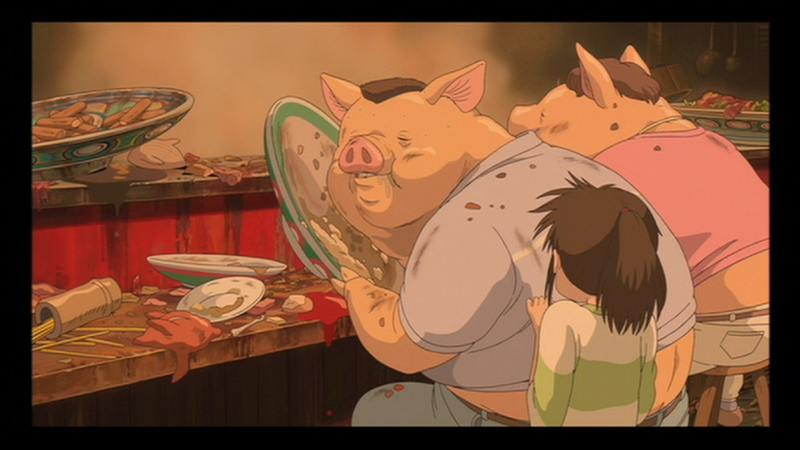 Sen to Chihiro no Kamikakushi (Spirited Away) begins with a buffet, where Chihiro’s parents sit down in a restaurant to devour the steaming hot food in a seemingly abandoned theme park. What they don’t know is that when the sun goes down the place becomes filled with spirits. Chihiro’s parents continue to chow down on the food while she sets off to explore, but when she returns her parents have literally turned into pigs! 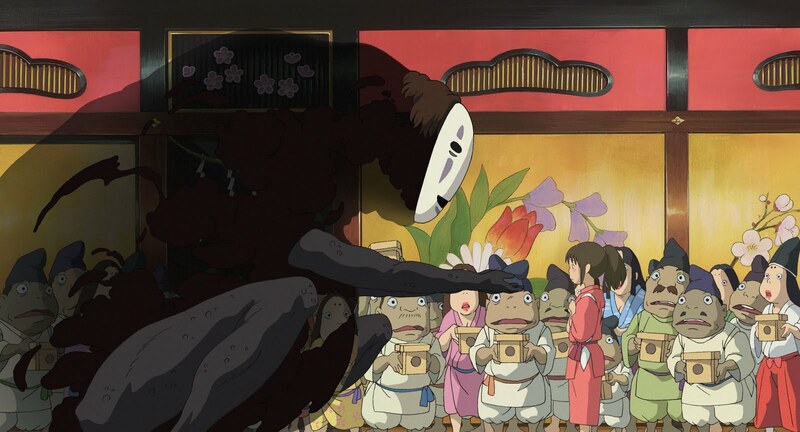 Chihiro has let a masked creature named No-Face into the bathhouse. No-Face tempts a bathhouse worker with gold to lure him in and swallow him whole. This gives No-Face the ability to communicate and demand more food by tempting all the other workers with gold for tips. He continues to demand food from the bathhouse and steadily grows in size. In the spirit world, Chihiro is slowly fading away. If she wants to stay and help her parents return to normal, then she must the eat food from this new world to remain grounded in their realm. If she continues to eat the food of the spirit world, Chihiro’s human smell will slowly fade away and make her part of their world. Chihiro is having a hard time accepting her new reality and the fact that her parents have turned into pigs. She’s been trying to exist in the spirit realm and find a way to bring her parents back. It’s when she realizes how daunting the task is that her mood takes a turn and she feels defeated. 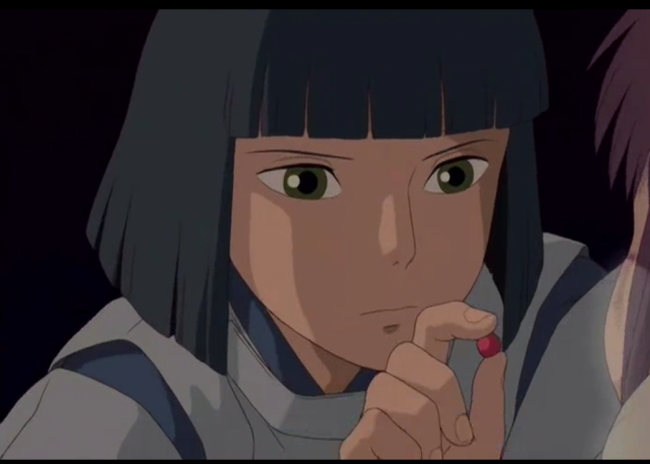 Haku, her friend and river spirit, gives Chihiro rice balls that he has put a spell on to give her back her strength. Chihiro is rewarded a magic dumpling that helps rid someone of malicious magic. This dumpling will become an essential component to the story and help Chihiro heal those she cares about. As a frugal ten year old girl, Chihiro splits the dumpling in two saving some for now and some for later. These soot sprites work hard to earn their keep in the boiler room, except when its meal time. 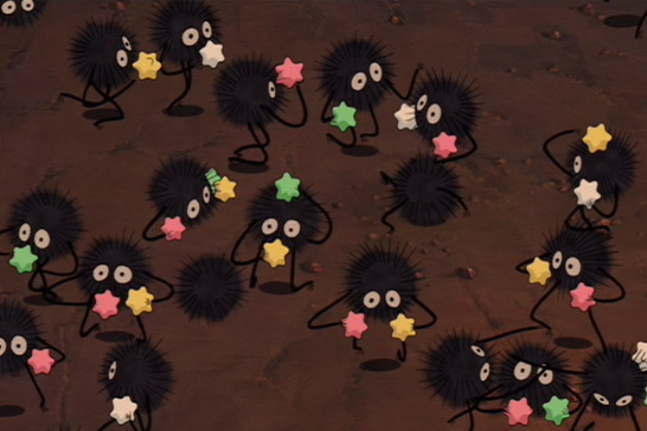 Lin, Chihiro's friend, feeds the soot sprites konpeito which is a candy shaped with uneven ridges that's comprised mostly of sugar and coloring. 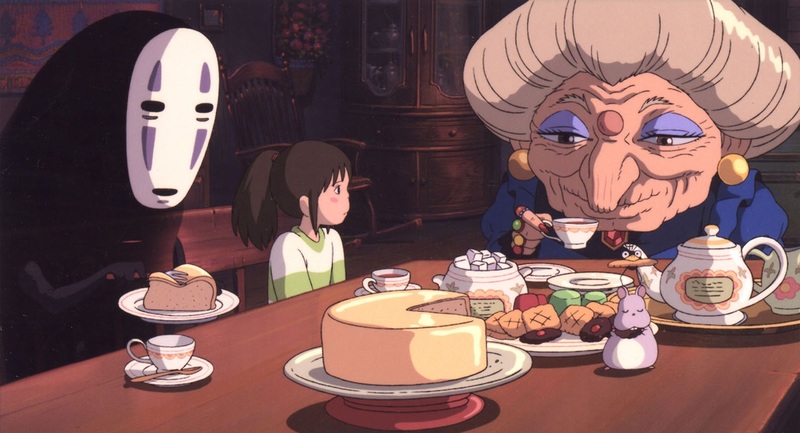 Cakes and tea accompany Chihiro's and No-Face's visit to Zeniba. The table of confections features a Japanese tea cake referred to as kasutera or castella cake which is a sponge cake. The bathhouse is in full swing and the workers stop at nothing to make sure their guests are satisfied. In the basket is an assortment of sushi and to the right of that is a decorated box of ishi yaki-imo or sweet potatoes roasted over hot stones. Lastly, is ikameshi displayed on a platter, which is rice stuffed squid that's cooked in a simmering soy sauce. 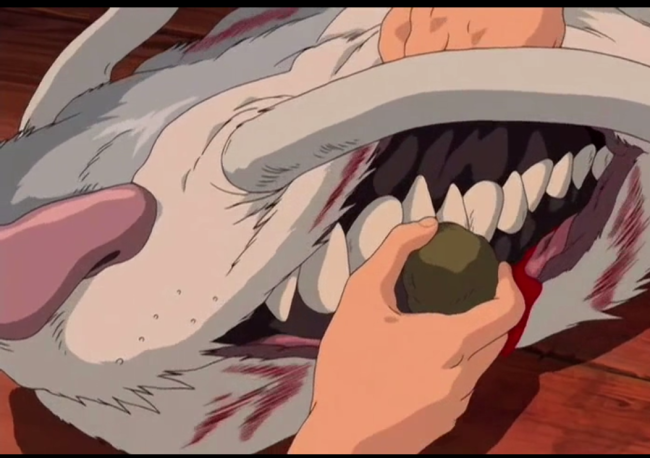 Chihiro and Haku from Spirited Away: Friends or More? 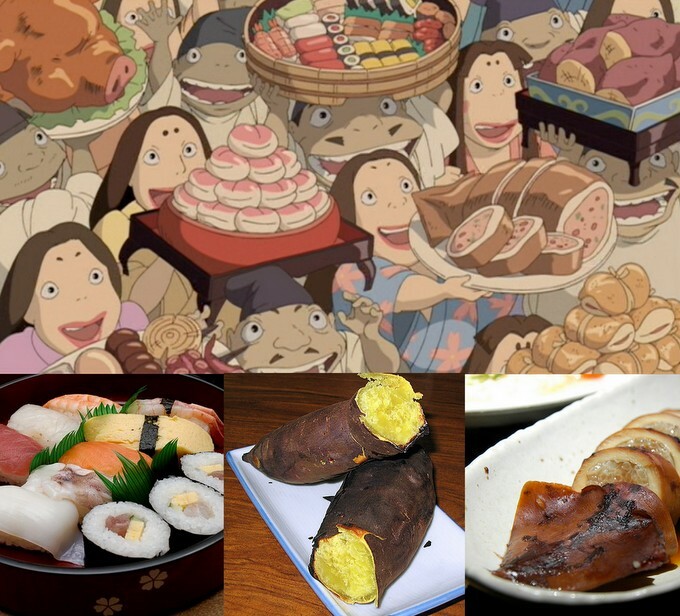 Sen to Chihiro no Kamikakushi (Spirited Away) portrays more than breathtaking magic, delicious food, and strange spirits. 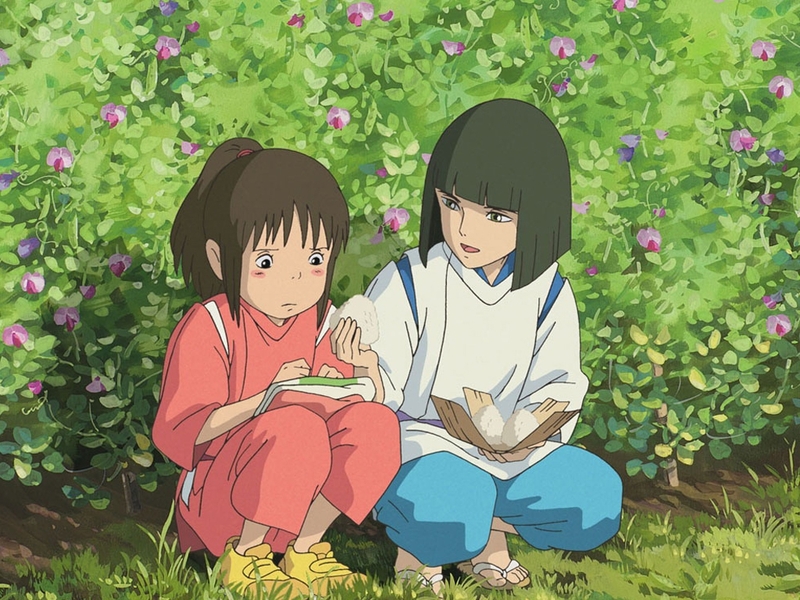 The main stars of the film, Chihiro and Haku, share a deep connection that becomes the most important aspect of the movie. Let's walk through the timeline of their relationship. Amongst the many other fanservice anime out there, Shokugeki no Souma stands out in more ways than one - but not for the reasons you're probably thinking. There's more to this cooking show than clothing-divested women and this article will show you why it's worth your time! Howl's Moving Castle has quickly become one of the most beloved productions ever to come out of Studio Ghibli. However, Howl and his magical castle actually had their origins inside the pages of a book and like as often happens, between the movie and the book are some fantastical differences. Howl no Ugoku Shiro (Howl's Moving Castle) follows the story of Howl and Sophie and their adventures in Howl's mysterious moving castle. As Howl and Sophie grow closer and mature as individuals, how does the castle change to reflect their deepening relationship?